The CouchGuard® recliner pull handle D style cable comes in two sizes only, 79mm and 123mm. Comes complete handle and cable and are a universal fit. The overal length of the 79mm exposed complete cable is 965mm and the 123mm exposed is 1050mm. 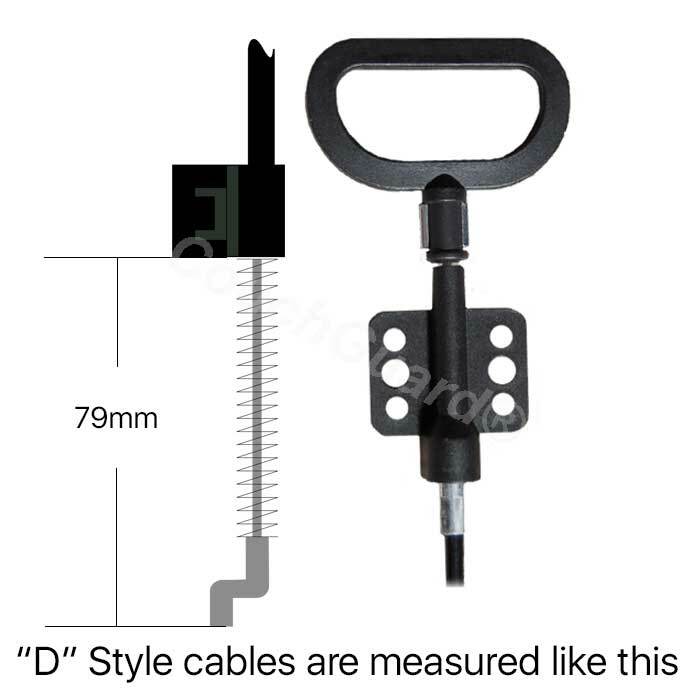 Tap or click on the Measuring tab to read how to measure or tap or click on the images to see how to measure the exposed cable length. Q. How do I measure the cable? A. You need to remove the cable from the recliner and measure the exposed cable length as per the images. Q. Will these fit my Nuttuzi couch? A. Yes. They will fit all makes and brands that use this style handle. 1 Turn the recliner on its side and manually open the recliner from underneath by finding the cable end then activate the release by hand. 2 With the recliner still on its side, disconnect the "S" and the black plastic clip loctated on the end of the sheath and attached to the recliner action itself. You will need a pair of pointy noise pliars. 3 Turn the recliner back and recline the recliner right back. 4 With a philips head screw driver, remove the 4 retaining screws from the plastic handle loctaed on the side of the seating cushion. 5 Fit the new cable by following these directions backwards from step 4. 6 Test the recliner opens smoothly. 2 Locate the seating cushion retaining screws and remove. Generally there will be 2 in each corner. This will allow the seating cushion to slide forward making the handle retaing screws more accessible. 1 Measure the exposed cable length only. From the black plastic clip to the very end of the "S" end. 2 The measurment will be 79mm or 123mm. All relciner parts are universal. Makes of recliners, brand names or manufactures part numbers don't mean anything.